Breaking the rules, and loving it! 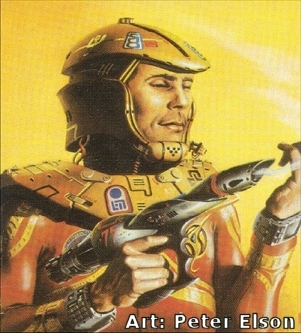 A Space Opera of a different color by Harry Harrison. A long time ago, there was a planet called "Dirt" (or something like that). It was there that humanity had its start, and from there they spread out, developing a large number of planets with diverse civilizations and forms of government. With enough wealth, you can enjoy a wealth of luxurious accomodations on various vacation planets. Then again, someday you might find yourself held at gunpoint while the government confiscates your ship and goodies and trucks you off to a short life of back-breaking labor for the good of the local planetary empire. But, hey, you should have read the tourist guide before you landed. Many people never get as far as space, of course. Many people spend their entire lives planetside, enjoying the kind of cheerfully dull life you could find in hundreds of towns and cities on Real Life Earth at this very moment. Only it's a little more peaceful than that, because, as it turns out, they've managed to stamp out crime. People no longer open their newspapers to read about murders and bank robberies and various missing persons. See, the government has gotten so good at spotting pre-criminals that they can whisk the kids away early for a little corrective programming, ensuring the safety and continued boredom of the general populace. Actually, follow his logic far enough and you realize that in the future world, where the population of all of Dirt is just a drop in the bucket compared to the population of the civilized galaxies, he might be right. So he robs a bank, takes a hundred billion credits or so. The bank loses nothing; the insurance policy kicks in. The insurance company loses nothing; they spread the loss out amongst their trillions upon trillions of customers by raising their rates. The customers, in point of fact, don't lose so much as two cents each, because the sheer number of customers makes the rate increase less than a penny per head. Besides which, Jim provides entertainment for the masses, who get to read about his exploits, and jobs for the police officers, who sorely need the practice. Win-win-win-win-win. That is, until a heist goes wrong, and Jim finally gets caught. Not by the police - nor by intergalactic law enforcement. He gets caught by the Special Corps, an organization that uses criminals to catch criminals (headed by Harold Peters Inskipp--a/k/a "Inskipp the Uncatchable", formerly the greatest criminal in the galaxy until he was tapped to become the Special Corps commander). See, Jim is a Technical Pacifist who sincerely believes that it's wrong to kill people (non-lethal violence is fine), including bad guys and people who might be trying to kill him. This puts him head and shoulders above the kind of villains that this organization deals with, who are perfectly willing to kill people, sometimes en masse. And, well, if you need to deal with a mass-murdering supervillain and the local police force isn't even equipped to handle a simple bank robbery, who better to forcibly recruit than the less dangerous sort of criminal? Jim, who isn't fond of the alternative (and who doesn't like a good lobotomy? ), decides to accept the offer, and thus becomes one of the operatives, given various assignments to track down and neutralize dangerous criminals at various locations across the galaxy. His first assignment is to neutralize a Femme Fatale serial killer who later becomes his wife and gives him twin baby boys. Oh, and also, he's about as infuriating to his boss as, well, any rather unconventional main character has ever been to Da Chief. Absent Aliens: Right up until one book introduces them by force. Most of them are slimy Starfish Aliens. Anti-Hero: Jim, with comparatively little "Anti" to the "Hero". Back-Alley Doctor. Jim goes to a Back Alley Doctor to have whole body alteration surgery in The Stainless Steel Rat. Now that's dedication to the art of disguise! Batman Grabs a Gun: Jim the Technical Pacifist does once almost kill a guy, who was a monster and indirectly responsible for Jim's mentor's death. Jim would've gone through with it, if he wasn't knocked out. Big Brother Is Watching: Surveillance is everywhere, and only the most skilled criminal can practise his/her art. See also the planet Cliaand in The Stainless Steel Rat's Revenge. Brainwashed: In The Stainless Steel Rat's Revenge, the Grey Men use a particularly brutal method where they implant false memories of the subject having their hands cut off, in order to shatter their sense of reality. Brainwashing for the Greater Good: Most people with criminal tendencies are caught and 'treated' early in life. Treated meaning having your personality wiped and replaced with a state-sanctioned one! For an otherwise humane civilisation, this little crime against humanity strikes a jarring note. Angelina has supposedly been implanted with an artificial conscience, but it's not the real mind-wipe: her husband frequently has to restrain her enthusiasm for torture and killing. This is mostly talk however -- when push comes to shove she recoils from the Complete Monster she used to be and does not kill. Although mess with her family and all bets are off. The Chessmaster: Inskipp, though only in the first novel. Most other times his role is simply that of Da Chief. Clingy Jealous Girl: Jim knows better than to cheat on his well-armed wife. Which doesn't stop her from putting a knife to his throat if he so much as looks sideways at the Girl of the Week. When Jim tries to weasel out of their marriage, she quickly produces a Hand Cannon from Hammerspace and invites him to reconsider. Esperanto is the official trade language, and actually used properly here and there in the books. A favorite subject of Harry Harrison, along with ethical atheism. Femme Fatale: Angelina in the first novel; in later ones (after her Heel Face Turn), more of a Dark Action Girl. Get Into Jail Free: At both ends of his career. In A Stainless Steel Rat Is Born, a young DiGriz allows himself to get caught in the belief that he'll meet criminal masterminds in prison who'll teach him the art of crime. As it turns out, he only meets the pathetic losers who are dumb enough to be caught. In "The Golden Years of the Stainless Steel Rat", the elderly DiGriz apparently loses his touch and gets arrested and imprisoned. It turns out he's still got it, and let himself get caught as the first step of a plan to bust an old friend out of the prison. I flipped a coin to decide, and of course won since I had palmed the coin before the toss. It was going to be action. Had to Come to Prison to Be a Crook: The Stainless Steel Rat tried to deliberately invoke this trope, hoping to learn the tricks of the trade from real criminal minds. Of course, he quickly realizes his mistake: He won't find any criminal masterminds in prison, because they don't get caught. Hammerspace: Exactly how do you conceal a .75 calibre recoilless? Plus the Rat always carries a myriad of miniature escape/burglary/explosive devices in his teeth, fingernails, skin, and who knows where else. Hand Cannon: The Rat's .75 calibre recoilless pistol- frequently referred to as "That piece of field artillery". Sometimes a 'compact' .50 is mentioned. Karmic Thief: Jim refuses to steal from anyone but rich corporations that are insured against theft, though once he is recruited by the Special Corps, he also turns his skill against various villains. Knockout Gas: Both local law enforcement and Slippery Jim use Knock-out Gas with great abandon, although slightly more realistically than is usual in fiction. Jim makes sure to use nasal filters or a mask to avoid breathing it in himself, it's usually invisible rather than brightly coloured, and there are numerous different types, with different effects, speed of action, duration and after-effects. La Résistance: The Rat teams up with underground organizations in several novels. Mama Bear: Angelina, for her husband and sons. Outlaw Couple: To the protagonist and his wife, an extended crime spree is a nice way to spend a honeymoon. Papa Wolf: Jim, for his wife and sons. And his sons for their parents. Did I mention they are a close family of highly skilled criminals and Special Corps agents? Master of Disguise / Full-Body Disguise: In a universe of ubiquitous surveillance and paranoid secret policemen this is a basic survival technique, ranging all the way up to full body surgery. Planet of Hats: Planet of Uniforms in the case of Cliaand. Police State: The Stainless Steel Rat's Revenge and The Stainless Steel Rat Gets Drafted (military dictatorship), while the planet in The Stainless Steel Rat For President is a Banana Republic. Rebellious Spirit: A pervasive theme is the power of breaking the rules, especially the ones that even rulebreakers follow. Shotgun Wedding: Jim tries to run off on the pregnant Angelina on the day of their wedding. She's having none of that. Either he goes with her to the altar, or he gets a huge hole blasted in him with her Hand Cannon. You don't mess with a pregnant woman, especially if she used to be a sociopathic murderer. Of course, once their marriage is entered into the planetary database, the cops are quick on their tail, which means that maybe Jim was right in avoiding a legal marriage. Shrink Ray: Used in at least one story to carry large equipment in a suitcase. Space Police: The Special Corps. Later they discover there's also a Time Corps and a Morality Corps, much to Inskipp's annoyance. Suicidal Pacifism: An entire planet in The Stainless Steel Rat Gets Drafted. Technical Pacifist: Jim is a classic example. He is quite happy to employ non-lethal violence, but he will not kill, either as a criminal or a law-enforcement agent. For Jim, there is no God or afterlife, so this life is all we get. Which means that to take someone's life is to take everything they have. The Fettered. Jim, but see Technical Pacifist. We Will Use Manual Labor in the Future. Particularly odd are the scenes of manual labour performed by advanced humanoid robots. Zeerust: The first novel was written in 1961. Why Don't You Just Shoot Him? : Averted in the first book when Jim tracks down Angelina only to find she's been lying in wait for him all along. Angelina just gives an Evil Laugh and shoots Jim four times in the chest and once in the head without even trying to find out who he is. He survives and tracks her down a second time. Angelina again sees through his disguise, but doesn't kill him because she's hoping he'll realise they're Not So Different. This page was last edited on 20 October 2017, at 17:46.